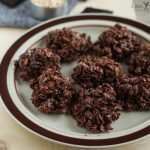 These paleo coconut macaroons are low carb, everything free, quick and easy, and absolutely delicious! Crunchy on the outside, chewy and soft inside! My sister and I have started a new tradition here at the ranch. Every Monday, the entire crew works together to pack our beef into boxes to ship nationwide. Every Monday, one of my younger sisters, a tragic coffee addict, starts a pot of coffee. Every Monday, many people drink this pot of rather bitter and dishwatery coffee, and every Monday we wish for And. Coffee And is the newest tradition. My sister and I take turns making the weekly And. Muffins, cookies, bread, you name it. So long as it pairs well with coffee. (Which, by the way, I don’t even like. I only drink coffee out of necessity. Basically only when I’m so tired that I can’t taste the coffee flavor and I desperately need the caffeine). 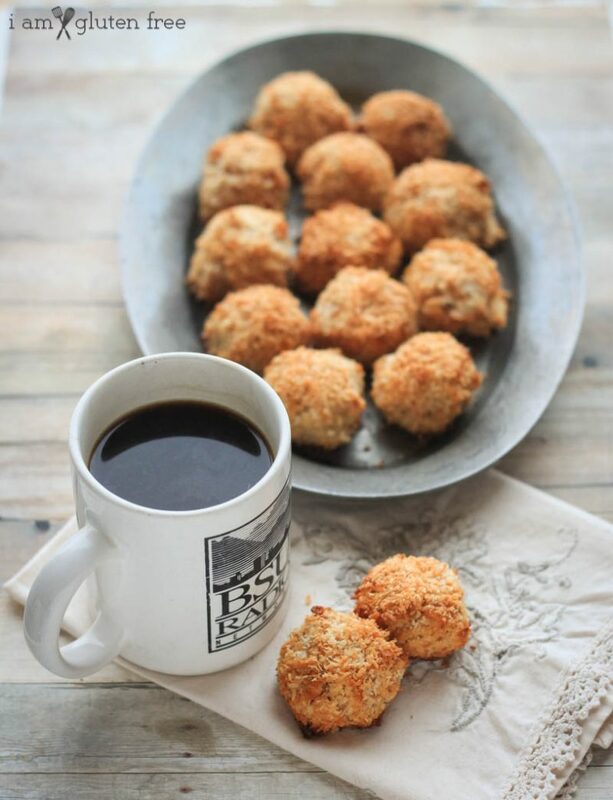 If you use toasted coconut rather than untoasted, you will get extra crispy paleo coconut macaroons–but they might not be so soft and chewy on the inside. 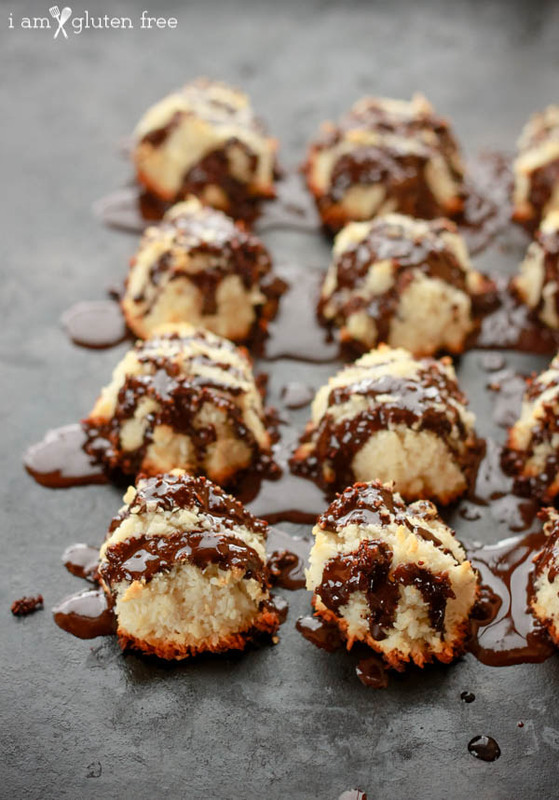 Another option is to roll the macaroons in lightly toasted coconut before baking! 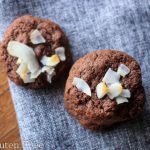 Recently, these paleo coconut macaroons have served as And. They are easy and fast so I can put them together Monday morning, they contain only five ingredients, they are actually not bad for you, and according to my coffee addict sister, they taste good with coffee. You’d better start up your own And tradition. Starting now. You can also add homemade honey caramel sauce on top…recipe soon! Cover a cookie sheet with parchment paper and grease lightly. Preheat the oven to 300 degrees F.
Cook the egg whites and honey over low heat in a saucepan, stirring constantly (don’t let that egg white solidify!) until honey is completely dissolves. Remove from heat. Pour the egg white/honey mix over the coconut mix. Stir until combined. 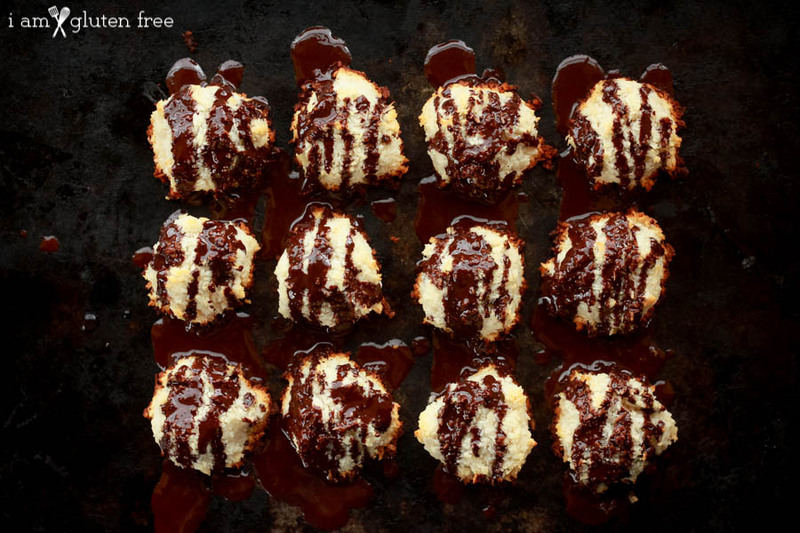 Spoon the macaroons onto the prepared cookie sheet. Bake for 25-30 minutes, until lightly browned on top and firm. Cool, then coat with melted chocolate or eat plain. For ultra paleo chocolate drizzle, I usually combine some 100% chocolate with just a pinch of honey and coconut oil! 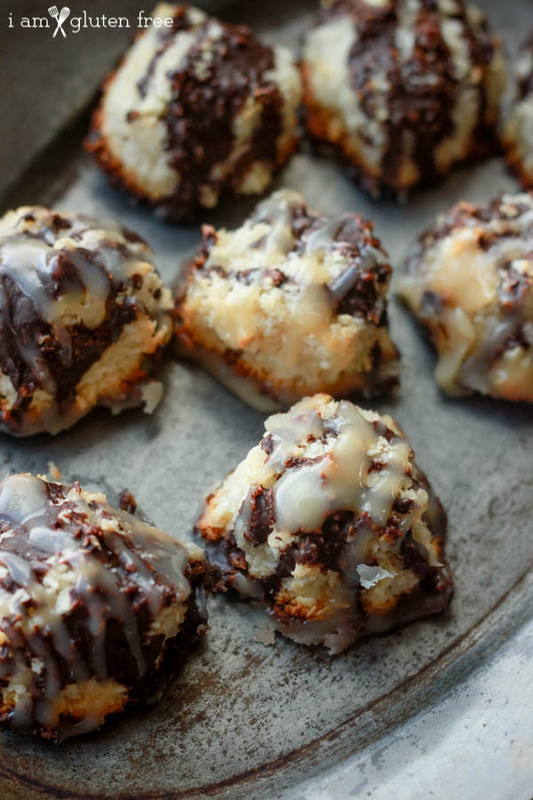 I hope you enjoyed these paleo coconut macaroons! 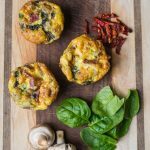 Want to make more paleo recipes? 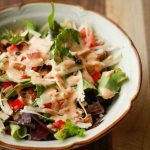 Check out my paleo recipe section! I made your macaroons last night- they are all gone. They were just a little dry- maybe because I used unsweetened coconut which I think might be dryer. I might try more egg whites next time or maybe a tablespoon of coconut oil. I looked and your recipe was prettyvsimilar to some chocolate macaroons I made once. Thanks for publishing. More low carb (w alternatives to honey since it is pretty much identical to sugar) would be great for me. Glad you liked the recipe! I’m not sure why they turned out dry for you, but adding a tablespoon of coconut oil sounds like a good idea. You could also use 1 T canned coconut milk. 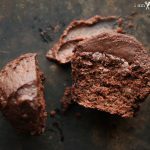 I’ve made these from another blog of the exact same recipe. They are extremely delicate and will crumble at a touch. I froze them afterwards which kept them from falling apart. They could use something else to bind them like some more moisture, either a little oil or more egg white. But, they are absolutely delicious and a lovely treat when on a strict liver diet. I’m sorry your macaroons crumbled! I’ve never had any problems with this recipe and crumbling, though…Which blog did you find the macaroons recipe on? And are you sure it was EXACTLY the same recipe? 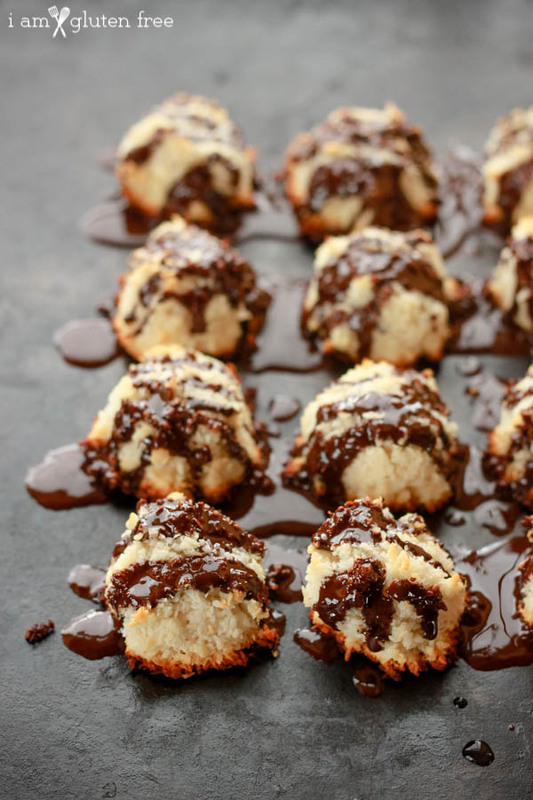 How many macaroons will this recipe make? 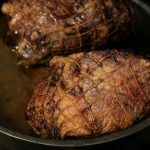 Is it really low carb? Honey has a lot of carbs in it. I estimate around 15 macaroons, but it kind of depends on how big you make them! As for low carb or not, I’m not an expert or anything and I suppose everyone has a different idea of what low carb is or is isn’t. I labeled these as low-carb because there’s only 1/4 cup of honey in the recipe and no really carb-filled foods like grains. I don’t have nutrition facts on this recipe and can’t give you any actual numbers. So sorry about that! I just made these and they were delicious! This was my 1st time making macaroons and im quite pleased. I read the other comments so I added almost an extra egg white and a tad more of raw honey. Then dipped them in melted 70% dark chocolate and let cool in the fridge..they are almost all gone and hasnt even been a couple hours! 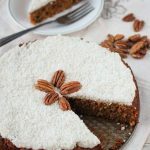 My kids love them..Thank sso much for this recipe! Oh good! Glad they turned out! That’s a good point! 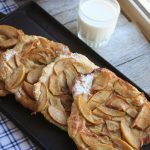 I labelled this recipe as low carb because there isn’t much honey included and there aren’t many other carbs. I personally don’t mind occasionally using honey as a natural sweetener, but I totally get that some people can’t eat honey or prefer to completely avoid all forms of carbs. Is it possible to use maple syrup instead of honey? Probably not, sorry! The stickiness of the honey really helps hold these together, and I don’t think they’d turn out well without honey. Thank you for sharing! 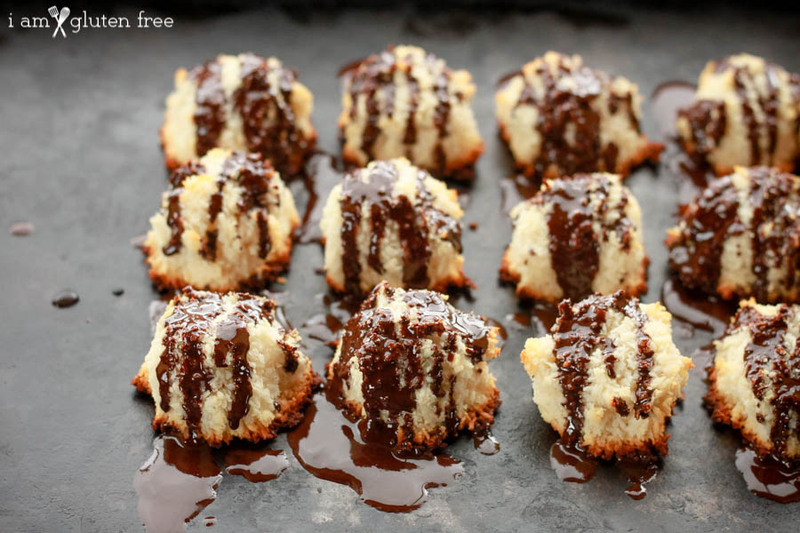 While I’m not Paleo or gluten free… these little delights were perfect! I only made half the recipe but they turned out perfect. I make these all the time and they are perfect 🙂 I don’t top them with anything, I just eat them plain. Thanks so much for the recipe!! Glad you like it! Thanks for the comment! i d like to try this recipe. But can i use fresh coconut meat? If yes, should i grate it? Hi Meila, sorry for the late response. I’ve never tried fresh coconut meat in this recipe, but it seems like it might have too much moisture to work properly. Let me know if you do try it. Thanks for your comment!